Dog collars are a popular form of animal identification for your dog. A nylon adjustable dog collar with a plastic buckle is probably the most common. If the dog gets caught by the collar, the buckle is designed to break free and release the collar, allowing the dog to get away rather than choking. Click here to purchase a nylon adjustable dog collar. Make sure that the nylon adjustable dog collar is the correct size. They come in several sizes even though the collars are adjustable. If you have a measuring tape, measure around the dogs neck, not tight but snug. This should tell you the average size in inches around the dogs neck. The collars are measured in inches. the dogs head. This will only work on dogs that have bigger heads than they do necks. For a dog that has a bigger neck than head, a harness should be considered. A nylon adjustable dog collar, or any dog collar, will probably not stay on. 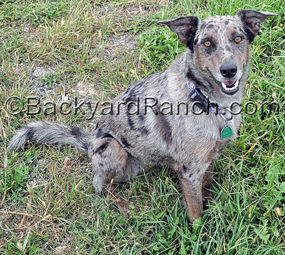 Here at the BackyardRanch, we have a dog that looses her nylon adjustable collar frequently. I have a spare collar in her size on hand and an extra tag. Nylon adjustable dog collars come in every color of the rainbow and all sorts of patterns including reflective and bright orange for hunting. Some have imitation jewels or faux fur. The most common purpose of the nylon adjustable dog collar is for the identification tag. The rings and ‘s’ hooks used to attach the tags can get caught just as easily as the collar itself, but the buckle should still break free if they do. There are slider tags available several places on line. These are great for those dogs that loose their tags or for owners that don’t like to hear their dogs tags clanking together. The slider tags can be engraved on both sides, they slide onto the collar and lay flat against it. The tag is stainless steel and inexpensive. They come in sizes that match the collar width sizes. I purchased ours from www.boomerangtags.com. Nylon adjustable dog collars and identification tags should never be the only source of identification for your pet. A microchip is the a great form of animal identification and is harmless to the pet. This way if there is a disaster or emergency where your pet loses their collar, they can still be reunited with you. If you want to go all out, your local veterinarian can microchip and also tattoo your dog for identification.